The days of stale old websites built in HTML and requiring an Act of God and lots of money to update even the simplest information are over . Hello WordPress. Now, clunky old CMS systems are gone and open source WordPress makes managing a small or medium website a breeze. Blogging is as easy as writing a Word doc. Updates are quick and live instantly. Hello World. Hello WordPress. We can show you how easy and how good it can be. We will help you identify the best CMS to use or we will use our standard offering and customize the back end tools to work exactly the way you want them to work. We will also provide training to use those tools to keep your site updated and current and full of fresh content for users and search engines. Changes can be made without relying on a website developer. Because it’s Web based, you can make changes and additions from anywhere. More control means less cost, more content. Changing, updating and adding content is completely independent of the site design. You can work within established designs without knowing code. It provides the opportunity to keep content fresh and both users and search engines like fresh content. 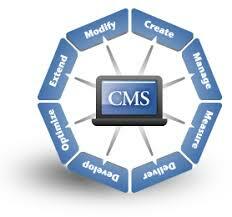 We have used many different CMS’s but and will also use MODX for larger sites.. It is an open based software that will be supported for many years. It is VERY SEO friendly and easily customizable.